When buying a pre workout, you want to be confident in the supplement you’re about to put into your body. The Genius Brand does a pretty good job displaying professionalism behind their products, both on their amazon listings and website. But, that’s marketing. How does Genius Pre actually perform when you hit the weights? For starters: Genius Pre is a stimulant-free experience. What does stimulant free mean? Stim-free means this is a mind and body pre workout, not a caffeine hype product like the majority on the market. Basically, Genius Pre is meant to offer pump and muscular endurance similar to other stim-free pre workouts like the economical MTS Vasky or everything’s included NutraBio STIM-FREE. For most of you, this is new ground considering that the main perk of most pre workouts is the caffeine rush. So if there aren’t any stimulants, then what’s actually in Genius Pre? Let’s take a look at what The Genius Brand chose to include in their pre workout. L-citrulline malate is probably the single best ingredient that a pre workout can include. This is because l-citrulline malate has been found to increase both performance and overall endurance with just one use. We’ve explored l-citrulline malate in detail, which you can view here. Genius uses 6 grams which is a valid dosage. Beta-alanine is another extremely effective performance booster used in pre workouts. But, there is a caveat: to get the most out of beta-alanine you must take it consistently over time. If you take it only once, your likely to only experience the ‘tingles’ sensation without any real performance enhancement. You can learn more about beta-alanine’s non-acute supplemental value here. Genius uses 2 grams of beta-alanine which is 1.2 grams under-dosed. Betaine is often used in pre workout supplements, but like beta-alanine it is best taken over time (and at any time of day). The main perk to this ingredient, is its ability to increase cellular hydration. This in turn sparks greater endurance as well as growth. Genius uses 2 grams of betaine anhydrous which is a valid dosage. The amino acid l-tyrosine is commonly used in pre workout supplements and energy drinks alike. This ingredient supports neurotransmitter production, and thus has the ability to improve both performance and mood (1). Interestingly, l-tyrosine appears to have the unique ability to reduce mental fatigue during extreme exercise in hot environments (2)(3). This isn’t always fully supported (4), however l-tyrosine’s ability to combat stress as a whole is noteworthy (5). Genius uses 1 gram of l-tyrosine which is valid. The Genius Brand chooses to include l-arginine in their formula, which may add to the nitric oxide boosting effects of l-citrulline malate. Or, it may not. L-citrulline is specifically used as a replacement to l-arginine due to its ability to weather the gut (6). Including both is non-typical, and unexplained on their website. Genius uses 1 gram of l-arginine which is trivial. The use of taurine in performance supplements is most popularly attributed to Red Bull. And while the research never quite came to conclusive determinations on its usefulness… Several supplements have decided to include it rather than not. Potential perks to taurine include improved energy and cellular volume. Though, research also suggests that taurine can have a calming effect making it a common ingredient in sleep aid supplements. Genius uses 1 gram of taurine which is valid. 600 mg Alpha GPC – A specialized form of choline which aids focus and overall mental clarity. 100 mg Rhodiola rosea – A natural adaptogenic herb that reduces stress. 30 mg Theobromine – While this is a non-stimulant pre workout, we consider theobromine to be classified as a stimulant. Expect a slight energy boost from this ingredient. 10 mg Huperzia serrata – Similar to Alpha-GPC, huperzia aids mental focus and clarity. 500 mg HICA – HICA is a special metabolite from leucine which may aid muscle growth, reduce DOMS, and increase performance over time (7). The only catch, is that you typically need a daily dosage of 1,500 mg or more (8). Genius only includes 500 mg.
150 mg ElevATP – ElevATP is meant to increase the amount of cellular energy available to the body. This translates into improved performance in the short term, and added muscle growth in the long term. Of extra importance, is that ElevATP is suggested to be effective at both 50 mg dosages (9) and 150 mg dosages (10). Genius includes 150 mg of ElevATP. 25 mg AstraGin – According to Nutracap USA, AstraGin helps improve the uptake of ingredients (11). Think of it as an alternative to bioperine black pepper. During the review period, our team had some great workouts while taking Genius Pre. The pump is present, and overall you do feel a deeper connection with your muscles and a small increase in muscular energy. For the price, we were satisfied too. It isn’t as good of a deal as MTS Vasky, but it also provides a different experience. After reviewing Genius Pre, we really weren’t satisfied with the amount of information about The Genius Brand. There website doesn’t explain the scientific validity of their products… We actually used more citations to scientific literature in this review, than they use on their product page. There products aren’t really ‘Genius’ in any sense. Overall, we feel that The Genius Brand is led by marketers who saw a significant opportunity on the Amazon storefront, and took it. There products aren’t bad by any standard, they simply do not impress us the way we’d like to be impressed from a brand that claims ‘genius’. 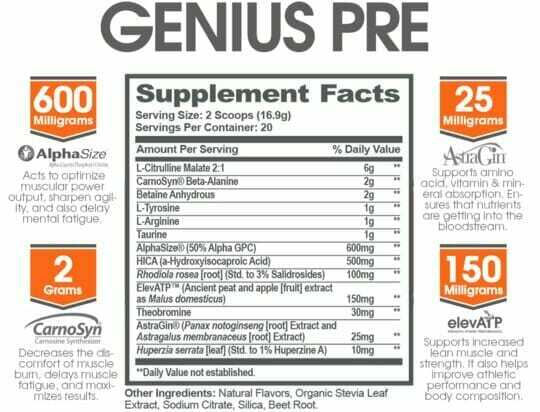 If you’d like a quality stimulant free pre workout that isn’t all fluff, consider Genius Pre. It isn’t out of the ballpark awesome, but it isn’t bad at all if you’re looking for pump, mind-muscle connection, and added mental clarity.